We meet Anders Ölund in one of his most remarkable creations. 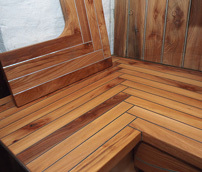 The bathtub is built from glued elm joints, where each strip was cut to the right shape before gluing. 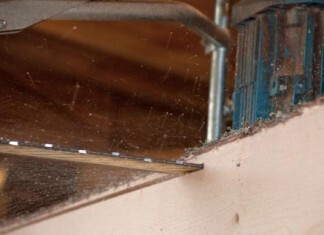 Anders started his career as a building engineer, and is trained as a woodworking teacher. Today he runs his own furniture business. Over the course of the years he has carved out his own unique style. 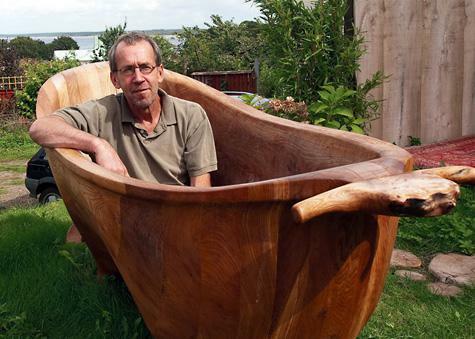 He uses Swedish hardwood, primarily elm, but also oak and wild cherry. He cuts everything on his own custom sawmill, which he built himself using components from Logosol’s stack cutter. The logs are often upwards of 1.5 metres thick and are selected so that the actual form of the wood becomes part of the final product. Even spikes and nails grown into the wood can become part of the final product. It is true that such objects shorten the life of the saw, but instead of cursing the nails, he lets them remain in place and become part of the experience. His idea is to account for nature’s forms and patterns. Part of this work includes tabletops of such outstanding quality that one might be just as prone to hang them on the wall as works of art in their own right. The surface treatment is the minimum possible: turpentine and various types of oil. The pictures speak for themselves. Anything is possible. All you need is imagination and a feeling for wood. Logosol’s circular resaw provides you with lumber of exactly the dimensions you desire. The circular resaw quickly and easily gives you high-precision results, and you can manage the entire process without help.